Dressed To Kill. Neil Swain. One page. A look at the character of Cathy Gale. Man Appeal. Michael Richardson. Three pages. A look at Emma Peel and Diana Rigg. What The Butler Saw. Ian Fryer. Two pages. 'The Town Of No Return' picked over. 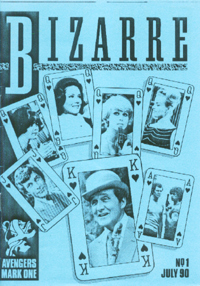 CI5: A Bizarre Supplement: Beginner's Luck. Ian Fryer. Two pages. A look at The New Avengers episode 'Obsession'. Backtrack: Klansmen . Ronnie D. Beaumont. One page. A look at The Professionals episode. The New Avengers Video Guide. Chris Bentley and Kath Staton. Six pages. A look at the first Channel Five New Avengers release which contained the episodes 'Faces' and 'Target!'. Brought To Book. Chris Bentley and Ronnie D. Beaumont. One page. Reviews of 'Stare Back and Smile' and 'Blind In One Ear'.